Ultra filtration plants can be constructed by employing hollow fiber membranes or spiral wound membranes. They work with a pressure of about 1-10 bar and they are suitable to separate big molecules present in water. 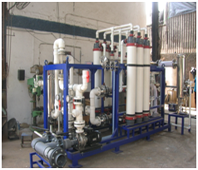 The ultra filtration plants have established a position in the drinking water sector due to the fact that they filter water to such an extent that it is virtually free of solids. Bacteria, parasites and viruses are not killed off, but entirely removed from the drinking water.